Pancake compressors are portable air compressors suitable for business and personal applications when you only need a small volume of air- like powering brad nailers, and general carpentry and roofing work. They are referred to as "pancake" because of their flat and oval-shaped tank design which is where the compressed air is stored (Source). 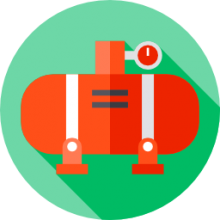 They will run off of your typical household electrical circuits- this makes them particularly valuable for DIY homeowners as well as small business owners that frequently require compressed air. Let's take a look at 5 of the best-selling pancake-compressors on the market today and see how they compare on features like SCFM (Standard Cubic Feet per Minute). The 34 lb, 18.3” x 18” x 19” Porter-Cable C2002-WK Pancake Compressor with an accessory kit is a quality option that includes 13 pieces of accessories. Its users love that it is well-built, but also note that it is quite loud for its size. It has a 6 gal capacity, delivers 2.6 SCFM at 90 PSI, and has a 150 PSI maximum pressure. Includes an oil-free, no-maintenance pump, and has a water drain valve and rubber feet. Low AMP 120 V motor easily starts ing in cold weather. The accessory kit includes a 25-foot nylon hose, blow gun and attachments, tire chuck, tire gauge, quick coupler, plugs, and Teflon tape. The product is backed by a one-year limited warranty on compressor components. This pancake compressor is a very good option if you are looking for a great value, well-designed compressor. Almost all people who have used this compressor are pleased with the good build and great performance. A number of users say that it has exceeded their expectations. The positive things they love about the unit include the easy to carry and heavy-duty design and quick charging. A few users, however, did not like the level of noise, the short electrical cord, as well as the low quality of some of the accessories that it came with. The 29 lb, 17” x 17” x 19.2” Bostitch BTFP02012 Pancake Compressor is an excellent option that produces 78.5 dBA operational noise level for less noise in the work environment. Its users love that it is great at delivering the promised 150 max PSI and 2.6 SCFM at 90 PSI, but also note that it can be hard to regulate pressure at lower levels. Its pump is designed for long life and is oil and maintenance free. High flow regulator and couplers are designed to maximize air tool performance with two universal couplers to easily support two users. The couplers are inline to a standpipe, to prevent twisting and the console cover is removable to allow easy repair of controls. It also offers a convenient cord wrap for easy storage. This 6-gallon pancake compressor is a very good option if you are looking for a well-designed and solidly constructed air compressor. Users generally consider this product a great buy. They are impressed with its quick refill and fast start up to 150 PSI. Users also like that it’s easy to carry and sustains pressure pretty well when constantly used. One user says that it is noticeably quieter than other compressors its size. On the negative side, some users say that the power cord should be a bit longer and that the line regulator dial does not react as quickly as preferred. 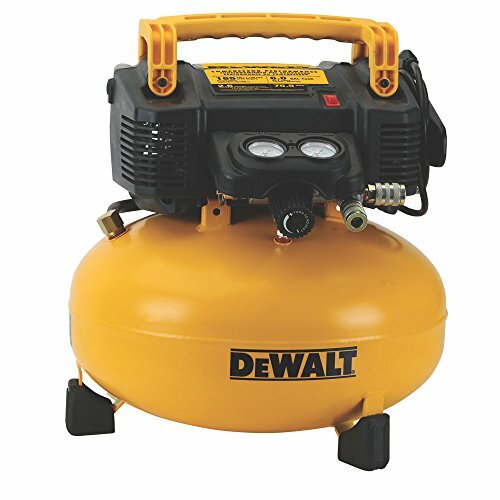 The 32 lb, 17.2” x 16.6” x 20.1” DeWalt DWFP55126 Pancake Compressor is a strong option that has a maximum pressure of 165 PSI. Its users love that it is solidly built and dependable, but a few also note that some units may have leak problems, which the manufacturer addressed satisfactorily. Its 6 gal tank delivers 2.6 SCFM at 90 PSI. Noise level is at 75.5 dBA for a quiet work setting. It has a long life oil-free pump for maintenance-free operation. A console cover protects the controls and is removable to allow easy repair. This unit also features 2 universal couplers to easily support two users, and a ball drain valve for quick and thorough tank draining. It has protective rubber leg covers to prevent marring and a cord wrap for easy storage. This portable air compressor is a good option if you are looking for an air compressor that gives a higher maximum pressure than similar-sized products. Users generally find this product performs very satisfactorily. It is well-built and has a rugged construction. It refills to 165 PSI very quickly, and because it is relatively lightweight, can be moved around easily. However, a number of users have complained about leakage, but these have been resolved quite smoothly with the manufacturer. A user also notes that he has to tilt the tank to drain out all the water. The 12.7 lb, 11.8” x 12.7” x 11.8” Campbell Hausfeld FP2028 Pancake Air Compressor is a practical option that stores 1 gal of compressed air. Its users like that it is small and very portable, but also note that its use is limited only to very light jobs. It has a user-friendly design, with gauges that are easy to read. The unit can deliver up to 110 PSI, and the tank is constructed to eliminate the pulsations caused by the piston action. Accessory kit contains 25-foot recoil hose, female coupler, male plug, air chuck, inflation needle, and 2-inch inflation nozzles. This highly portable pancake compressor is a fair option if you are looking for a small air compressor for minor jobs at home. The general consensus on this product is that it works fine for small quick jobs that it’s intended for. Users like that it is easy to pick up and move around, and doesn’t take up much space. Its low price point and ease of use are what make it attractive to the average user. Some negative comments on it include its noise levels (too loud for its tiny size) and the lower than promised pressure level that it can typically achieve. The 47.4 lb, 22.5” x 20.4” x 20.6” PORTER-CABLE PCFP12234 3-Tool Combo Kit is an excellent option that includes two nailers and a crown stapler with the 30 lb PORTER-CABLE C2002 compressor. Its users love that it is a good bargain for what is included in the set, but also note that the instruction manual is hard to follow. 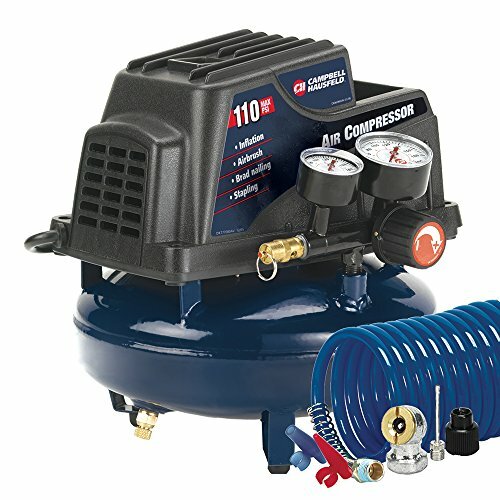 The oil-free compressor has a 6-gallon capacity and delivers a maximum pressure of 150 PSI and 2.6 SCFM at 90 PSI. The 2 nailers are the FN250SB (16ga 2-1/2-Inch Finish Nailer) and the BN200SB (18ga 2-Inch Brad Nailer). The stapler is the heavy duty 3/8-Inch TSO56 Crown Stapler. It also comes with a 25’ long, 1/4″ diameter air hose with coupler and plug, belt hook accessory, and fasteners. This portable pancake compressor kit is quite a good option if you are looking for a set of power air tools that come with a very decent air compressor. People who use this compressor and the tools that come with it are quite happy with the performance. The compressor fills up in a matter of seconds and the tools do not jam. It may not satisfy those looking for an industrial compressor for running multiple tools from a single unit, but for home improvement projects, it exceeds expectations. When buyers shop for these compressors, they frequently look to either online or retail stores like Home Depot, Walmart, Lowes, Harbor Freight as well as Sears to find the best price. 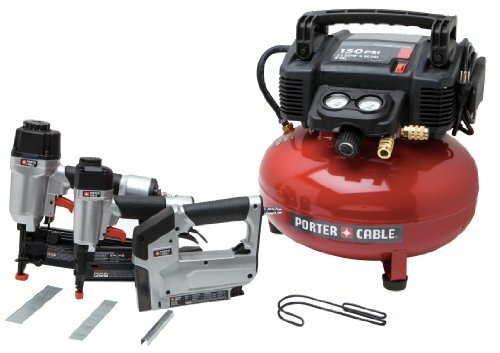 As we have seen, there are a variety of quality buying options available on the market today, with the Porter Cable pancake compressor even shipping with an optional combo kit that includes a finish nailer, a brad nailer as well as a crown stapler. These small and portable air compressors generally are free of oil. What this means, in actuality, is that oil does not leak out of the compressor with the air, which would require an oil separator. All of the compressors oil is retained inside of the unit. As well, they generally do not require much maintenance- you'll just want to clean it off every so often to make sure that it retains its appearance and test that it continues to compress air. Simple in design, all you have to do to get up and running with one of these pancake compressors is to plug it in, hook up the air hose, and connect to a range of different compressed air tools of your choosing. 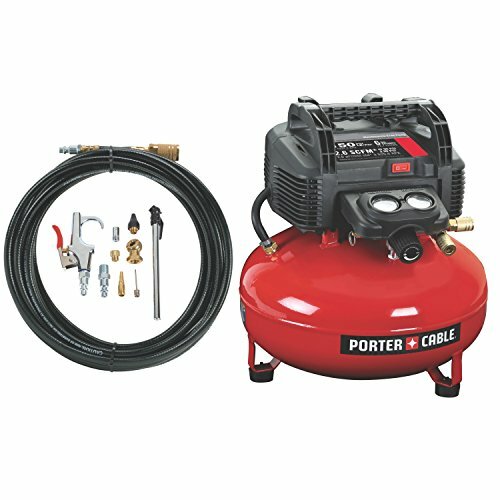 People that purchased the Porter cable C2002, for example, were generally fairly pleased with this particular air compressor. One user who identified himself as a novice homeowner, not particularly savvy with power tools, says that he enjoys home-improvement products and generally tries to buy the best quality tools to get the job done. He purchased this Porter Cable model and says that it is absolutely required that you break in the air compressor before using it. He says in order to break it in, there are instructions included that walk you through the process, but in general the bottom line was that you need to open the drain valve to ensure the pressure doesn't build up and when you turn on the compressor you have to blow the air out of the valve. Then you have to run it for around 15 minutes- this is essentially a dry run without any pressure. After the 15 minutes is over, screw the valve closed and ensure the pressure builds up until it shuts off- and then you're good to go. Another user who is much more experienced using these pancake compressors says that it's a high-quality option that is really small and incredibly powerful, especially considering its price. An interesting piece of wisdom one reviewer offered is that it doesn't have any sharp corners- this makes it particularly portable, and says that it has enough capacity to power two framing nailers working simultaneously. As far as its residential applications, users say that it's great for inflating tires, providing air to staplers or brad nailers. Another popular option was the Bostitch 6 gallon pancake compressor- one user describes installing a hardwood floor using this particular compressor with a flooring nailer and stapler attached to it. One user describes having owed this particular air compressor for over four years, saying that it is a reliable tool that has never required any sort of repair. He would estimate that he's run over 1200 nails through it. He also advises potential buyers that is not very noisy, basically comparable to all the other small pancake compressors that he is used over time, and it is equipped with a bottom release enabling you to drain moisture and air from the unit when needed. The DeWalt is another solid option- one user in particular noted that it is a bit more expensive than some other options, but he felt particularly confident purchasing from this particular brand and says that it is a powerful and quiet unit that does require the usual break in to get it up and running correctly. Another reviewer seconds this appraisal, saying that Dewalt typically produces quality products that are better designed and more durable than the competition. That said, this particular user did have some air leak issues which he discovered were on account of the hose fittings and the ball bearings located inside that created a means for air to escape. He ended up fixing it himself, and this seems to be an isolated incident as most users haven't experienced this issue with their pancake compressor. Indeed, if you're purchasing a pancake compressor, obviously you don't want to be dealt a defective unit, but for those users inclined to work with their hands they can generally discover how to fix some of these annoying issues. In the worst case, you may have to return the product and luckily the warranties with these pancake compressors are pretty strong. In terms of general advice, make sure you research how to break in your pancake compressor prior to use -this is a crucial step that you will not want to ignore. If you are using your unit outside, make sure that when you plug it in the circuit is protected by a ground fault circuit interrupter- this will help to detect and then shut off current that is flowing into the ground, thereby helping to protect against electrocution. You will also want to do the initial audit of the pancake compressor, as well as ongoing evaluations to ensure that there are no air leaks occurring with your unit.